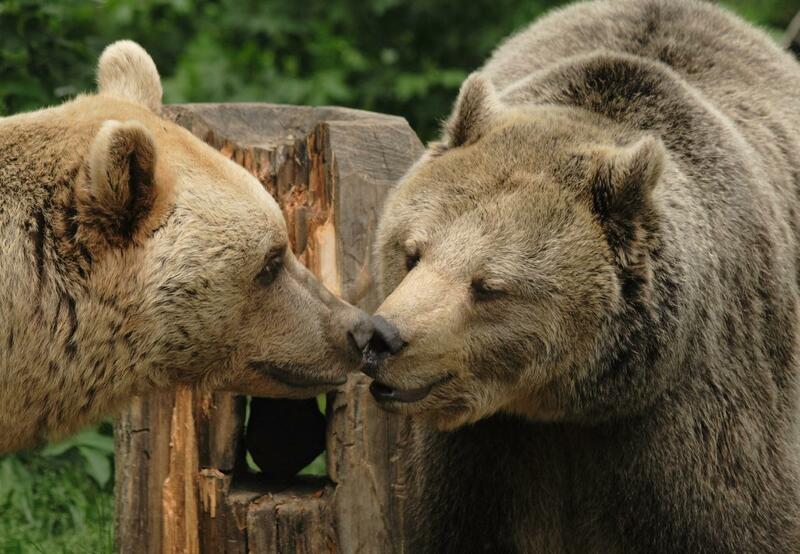 BEAR SANCTUARY Arbesbach in Austria is the first FOUR PAWS bear sanctuary, founded in 1998. The sanctuary offers lifetime homes for 7 brown bears that were privately owned or came from unsuitable conditions, such as circuses. The sanctuary is approximately 3.5 acres and offers educational opportunities for guests. These include an informational center with video footage of bear rescues and former keeping conditions as well as interactive learning stops on the sanctuary's pathways - including one with an actual sized transport crate used during FOUR PAWS rescues! As the first FOUR PAWS owned and operated bear sanctuary, it has helped set the precident for other FOUR PAWS sanctuaries. Each FOUR PAWS bear sanctuary maintains a high standard of care for its rescued animals. Animals at all of our sanctuaries will never be bred, sold for profit or traded to other sanctuaries, zoos, or any other animal practice or trade. Animals we rescue find a home at our sanctuaries for life! Open from April to November 1st from 10 a.m. to 6 p.m.
Bears and other wild animals that have grown up under human influence, unfortunately, cannot be released into the wild. In captivity bears lose vital instincts they need to survive, especially learning how to hunt and scavange for food. Left to themselves, these animals could no longer survive in the wild. Our rescued bears also have behavioural disorders due to their former caged existence, and as a result, they require special attention from our animal care staff. This is why FOUR PAWS provides life- long care for each animal at our sanctuaries! In our extensive, wooded enclosures, Emma, Miri, Erich, Vinzenz, Brumca, Tom and Jerry are able to rediscover their instincts and act on their natural behaviours. Find out more about BEAR SANCTUARY Arbesbach here.